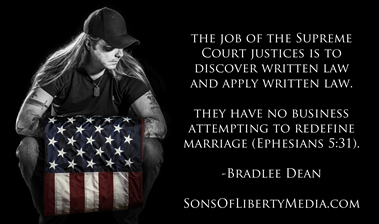 While there are some American people that are ignorantly anticipating the Supreme Court’s decision on what its definition of marriage is, it is important to remember that the job of the Supreme Court justices is to discover written law and apply written law. They are not there to legislate or to activate, nor is it their business to redefine what they do not agree with when it come to the One who gave law. • Kagan hired former ACLU lawyer William Rubenstein to teach “queer” legal theory, in which he taught courses on taking up new identities such as bisexuality, transgender f**k, involving polygamy, sadomasochism, and the sexuality of minors. • Kagan also hired other radicals (a lesbian and a transsexual) to teach transgender law courses, as well as Cass Sunstein, who has written in support of polygamy and free-for-all marriage relationships. • Kagan viciously attacked our military in opposition to “Don’t Ask, Don’t Tell,” even banning military recruiters from coming on campus. Kagan’s attempt to ban the recruiters was unsuccessful, and even after losing her legal campaign, she encouraged students to continue protesting them. • Kagan’s radical activism on campus was so toxic that there was even a campaign to make the entire university trans-inclusive, using Harvard’s “gender identity” non-discrimination policy to spew gender confusion among students on campus.